My sister Laura loves ice cream more than anyone I know, and if she didn't have the willpower she does, she'd succumb to a pint of Haagen Dazs or Ben and Jerry's every day, but I think she manages to limit herself to just a pint a week. 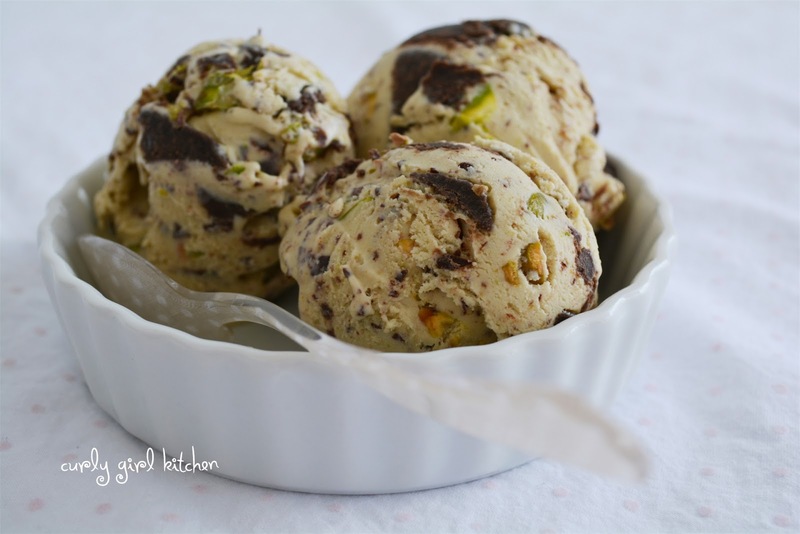 The other day she was talking about how pistachio was one of her recent favorites, and I knew right away what my third recipe would be for the bag of pistachios I'd bought. And then I remembered the leftover brownies I'd frozen after making brownie pops for a baby shower last month, and the recipe started to all come together in my mind. 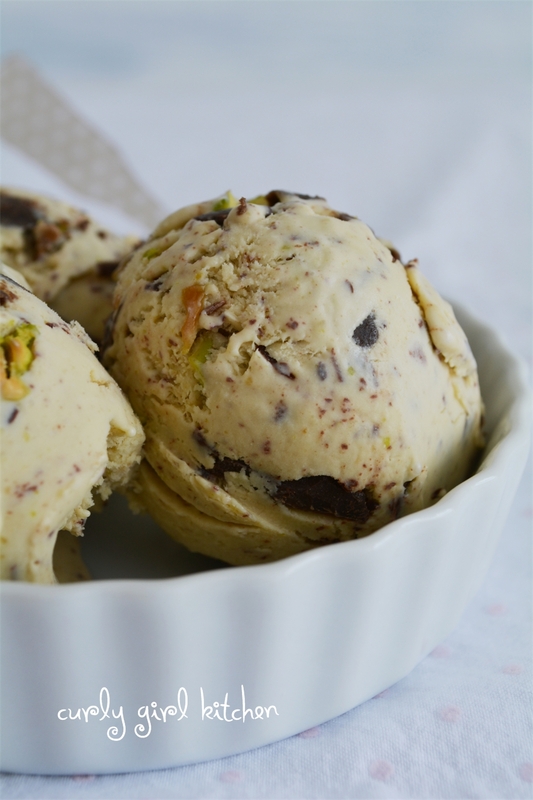 Every time I make homemade ice cream, I think that this one is the best that I've made yet, but this was really so good that it was hard to not keep going back for more spoonfuls to be sure that it was just as silky and rich as I thought it was. 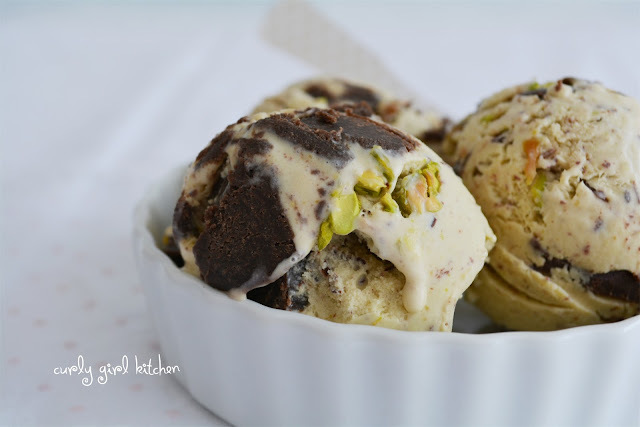 Between the salty sweet pistachio custard and the chunks of brownies, chocolate and more pistachios, it was as close to ice cream perfection as I could want. And I think that Laura, ice cream connoisseur that she is, would agree. 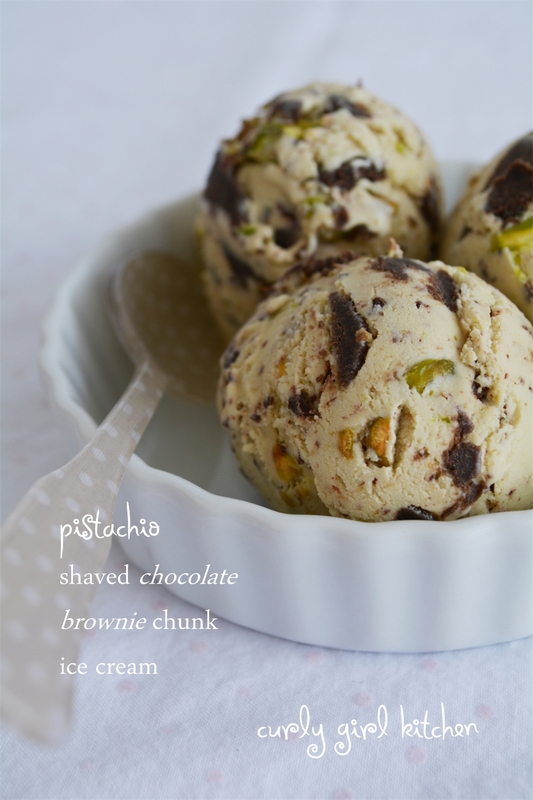 Reserve 1/4 cup of the pistachios. 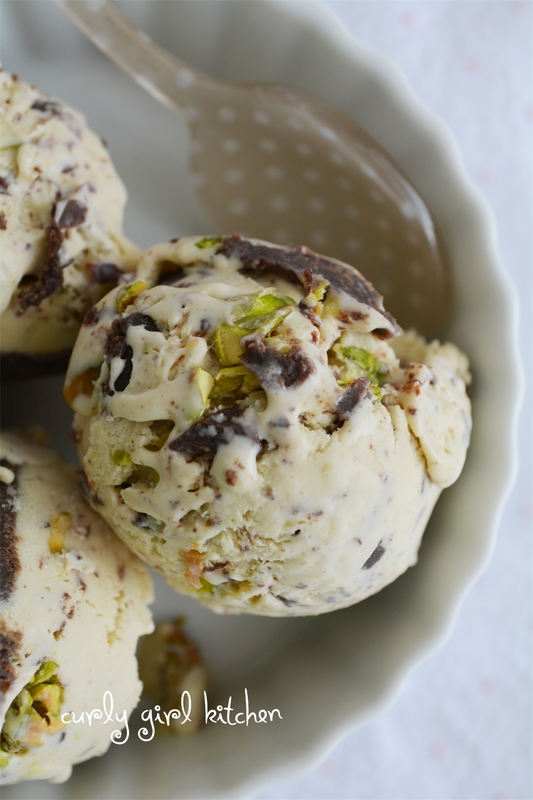 (If the pistachios are unsalted, add about 1/2 teaspoon of coarse salt.) 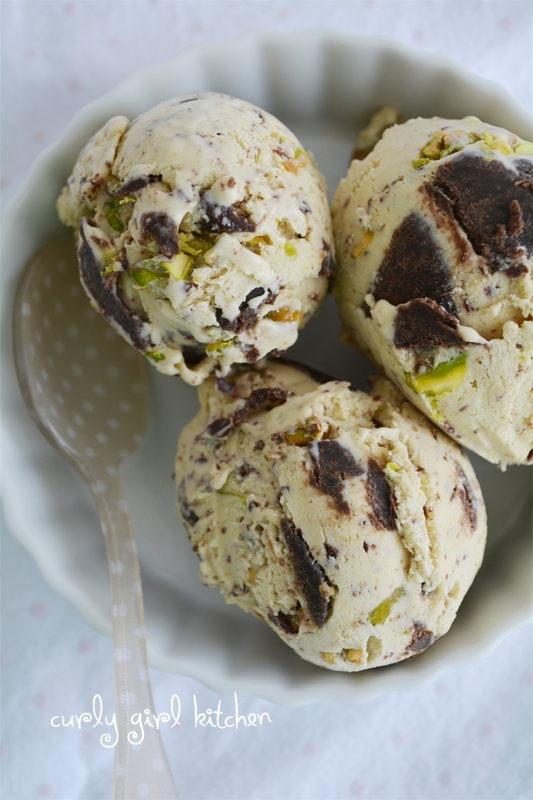 Place 3/4 cup of the pistachios in a food processor and pulse until very finely ground. Scrape the ground nuts into a saucepan and add the cream and milk. Bring just to a simmer over medium heat. Remove from the heat, cover the pan, and let steep for one hour to infuse the flavor of the nuts into the liquid. Pour the cream mixture through a mesh strainer into a clean saucepan, pressing the nuts to squeeze out as much liquid as possible. Bring the cream back up to a gentle simmer over medium heat. In a bowl, whisk together the egg yolks and granulated sugar. Slowly whisk 1 cup of the hot cream into the egg mixture, then scrape the egg mixture into the saucepan. Cook the custard over medium heat for several minutes, whisking constantly, until thickened enough to coat a spoon. Remove from the heat and stir in the vanilla. Pour custard through a mesh strainer into a bowl to remove any bits of cooked egg. Cover the bowl with plastic wrap resting right against the surface of the custard to prevent a skin, and refrigerate until well chilled, preferably overnight. Churn the custard in your ice cream maker according to the manufacturer's instructions. 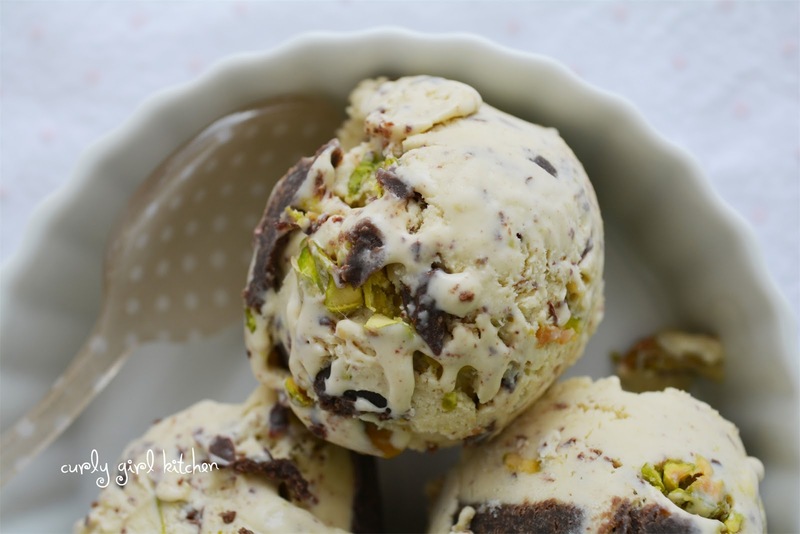 Meanwhile, roughly chop the remaining 1/4 cup pistachios (you can lightly toast them in the oven, if you like, and cool them completely), cut the brownies into 1/2 inch chunks, and use a sharp knife to finely chop the chocolate into shavings. In a bowl, mix together the churned custard, chopped nuts, brownies and chocolate, then transfer to a container, cover and freeze until firm, about 4-6 hours.